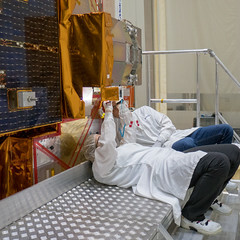 With liftoff less than three weeks away, ESA’s Aeolus satellite has been fuelled and is almost ready to be sealed within its Vega rocket fairing. Getting a satellite ready to be launched involves a long list of jobs, some of which are trickier than others. Since hydrazine is extremely toxic, only specialists dressed in bulky astronaut-like suits remained in the cleanroom for the duration of the activity. Aeolus has been at Europe’s spaceport near Kourou, French Guiana, since early July where it has been tested and now being readied for liftoff on 21 August at 21:20 GMT (23:20 CEST). Now that Aeolus is fuelled, the next job on the list is to place it in the Vega rocket fairing. This pioneering mission is set to provide global wind-profile data, using powerful laser technology that probes the lowermost 30 km of our atmosphere to yield vertical profiles of the wind and information on aerosols and clouds. The mission will improve our understanding of how atmosphere dynamics work and contribute to climate change research. At the same time, it will also help to predict extreme events such as hurricanes and help us to better understand and model large-scale wind patterns driving weather such as El Niño. It is also expected to bring considerable benefits to society by improving weather forecasts. Its global wind measurements, delivered almost in real time, are exactly what meteorological centres are looking for to improve their forecasts.